The perfect jumping-on point for any and all readers and its FREE! When rogue mega-billionaires with world-destroying technology threaten the safety of the entire world and the moon Thor and Iron Man join forces! 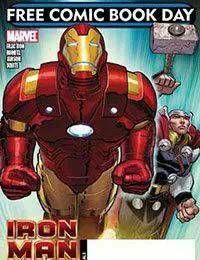 In time for the exciting launch of new stories and a bold new direction for Invincible Iron Man and Thor, superstars Matt Fraction and John Romita Jr. team up to bring you two of Marvels heaviest hitters like youve never seen them before!